This unit is located in THE SOUTH and IS ready to work today..
(Spec # NS-137-129 CC. 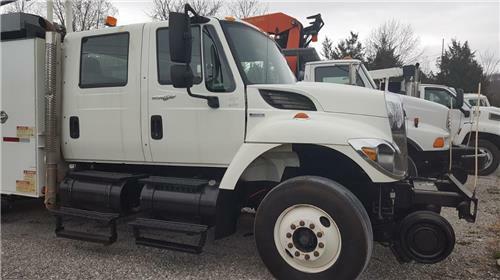 This truck is equipped with a DT466 Engine 245 HP/620 ft lbs - Eaton Fuller 10 Speed Transmission - Only 121,944 Miles - IMT 5200 Knuckle Boom Crane Rated at 8000# - Spring Suspension - 33000# GVWR - 12000# Front Axle - 21000# Rear Axle - 205" Wheelbase - Nice array of boxes on the body. This truck has been fleet maintained by Norfolk Southern Corporation. ** Only 121,944 approximate mile son this truck . Truck is ready to go, and very clean. AS YOU CAN SEE THIS TRUCK IS IN BEAUTIFUL CONDITION.